The Berlin software company EyeEm has launched a new photo app: The Roll. The free app provides a smart gallery – photos are automatically tagged by theme and arranged by relevance. The user gets a better overview of their own images and the more relevant photos are displayed higher in the stream. An image recognition algorithm rates the existing photos from the library and uses a ‘quality score’. The score is like an aesthetic assessment of the image that determines how far up the image appears within the gallery. “For the algorithm behind the technology, one must imagine a small child who goes through a photography study, from morning to evening collecting new impressions and learning constantly,” explains Florian Meissner, co-founder and CEO of EyeEm. 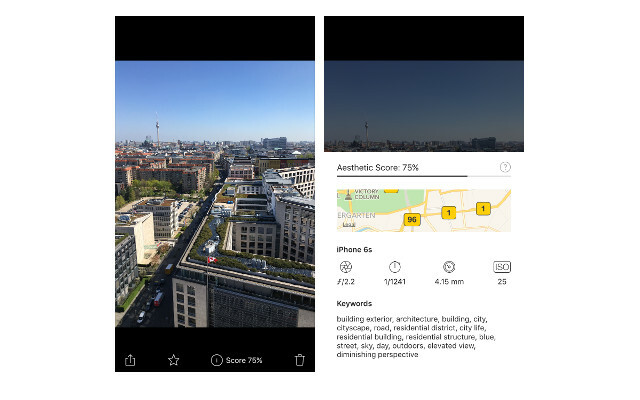 In a first test by the Gründerszene editorial with a photo taken with a Berlin skyline, the app detects, streets, buildings and the sky and groups the picture under the subject blocks “Berlin”, “Skyline” or “Blue”. Photo network EyeEm, cooperating with Getty Images among others, has been active since 2011. Initially, the Berlin-based startup was often compared to Instagram but now it differs from the Facebook app a lot mainly due to its photo marketplace. Just last year EyeEm collected 18 million US dollars from several investors, including Peter Thiel to further expand the market. Currently, the network has approximately 17 million photographers worldwide. The test of The Roll shows that the app quite accurately categorizes images into subjects like landscape or food. For photos of people on the other hand quite curious groupings came up. For example, the theme group “cute” was created, grouping random images, which for our taste were quite far from cute. On each image you can see which tags the app has set and its quality score. The fact that the app finds it hard to group faces seems due to the European legislations. Facebook Moments, also a gallery app that is also available in Germany since this week, had to pull back on face recognition in Europe. A privacy law from 2012 prohibits Facebook from automatically detecting people on uploaded photos. At EyeEm they’re aware of the problem – and believe a solution has been found. “The images are not stored on servers. Everything remains completely private on the telephone. We only enrich the existing images with data and make them searchable,” says co-founder Florian Meissner. So far, The Roll is only available on iOS. Facebook Moments is also available for Android. This article was originally posted on Gründerszene.